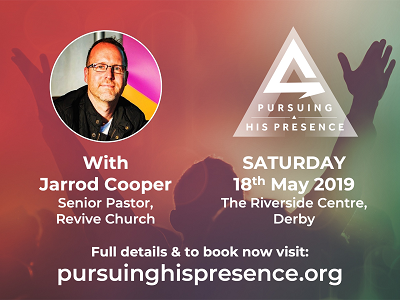 Some members of our church have been attending the Jubilee Church Derby 'Pursuing His Presence' Academy over the last few months and will be attending the conference in May at The Riverside Centre, Derby. The conference is open to all with speaker Jarrod Cooper of Revive Church as well as Paul and Jo McCullough and David and Rosie Fellingham. It looks set to be an amazing day and with a price break at the end of March, there is no better time to book your place. Book now direct through Jubilee Church Derby and let us know if you're going. It would be great to have a number of people from our church family attend the conference. NB: This event is not hosted by City Valley Church. All enquiries and bookings should be made to Jubilee Church Derby.